In a 2015 report, the U.N. estimated the annual cost of eliminating world hunger to be $116 billion per year. 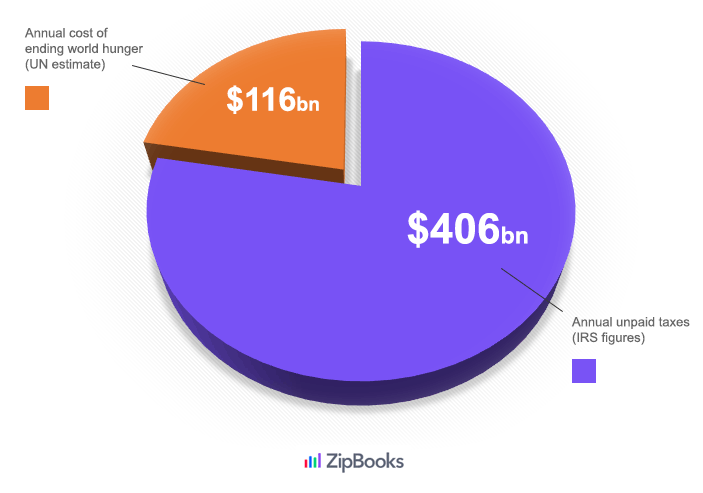 In 2016, the IRS published their Federal Tax Compliance report, which estimated the annual tax gap (true tax liability – tax eventually collected) at $406 billion — enough to end world hunger 3.5x. To ensure the drop in hunger is sustainable, the U.N. report — prepared by FAO, the World Food Programme (WFP) and the International Fund for Agriculture Development (IFAD) — estimated an additional $151 billion per year is required for investment in irrigation, infrastructure, and credit facilities. 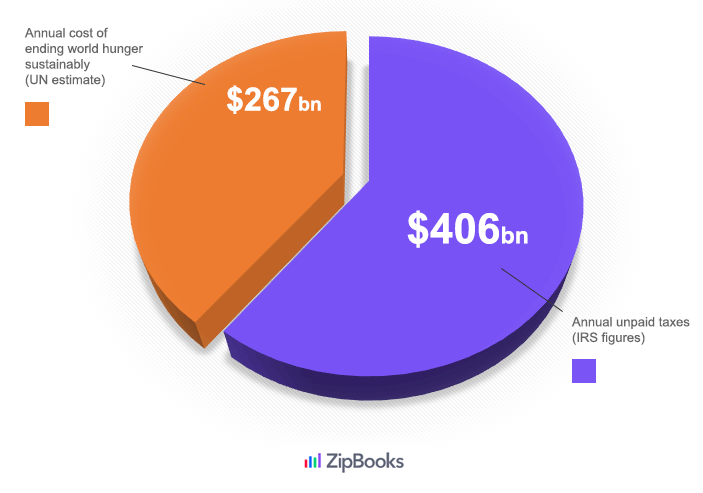 This takes the total sustainable cost of ending world hunger to $267 billion per year, just 0.3% of global GDP, and 63% of the Federal Tax Gap. 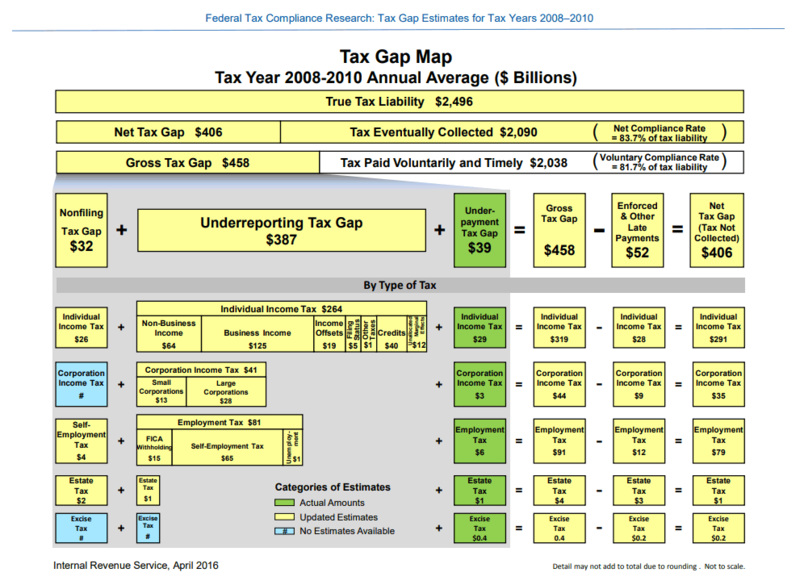 Note: The IRS figure is the net annual tax gap, i.e. final tax collected after late payments and enforcements. On taxing filing deadline day, the gross average unpaid taxes were $458bn (2008-2010), with $52bn collected after the deadline. In 2016, 815 million people (11% of the global population and 2.5x the population of the USA) went hungry. A 2012 paper, published by the Journal of Sustainable Agriculture concluded that we already grow enough food to feed 10bn people, 1.5x the current global population. Tax filing deadline 2018 falls on the 17th April. Holt-Giménez, Eric & Shattuck, Annie & Altieri, Miguel & Herren, Hans & Gliessman, Steve. (2012). We Already Grow Enough Food for 10 Billion People … and Still Can’t End Hunger. Journal of Sustainable Agriculture – J SUSTAINABLE AGR. 36. 595-598. 10.1080/10440046.2012.695331.